Let’s face it; Few sets of documents are as intimidating as is a set of formal tender documents for the lay person. It’s a 60 to 80 page bundle of nebulous speak and questions that are mostly irrelevant to what you want to tender for. It’s only after you have acquired an understanding of “Supply Chain Regulations” that things start falling into place. The Supply Chain processes have been designed to ensure a fair and competitive process in obtaining the required goods or services for the State Parastatal or Municipality. The Supply Chain Department is supposed to be totally divorced from the operational Department that writes the specs and then give it to Supply Chain to advertise and process. The theory is that after proper processes have been followed, a committee of experts have examined and recommended the offers on the table; it is then escalated to a decision-making body that will approve or reject the recommendation. The reality however is different (and this is not only true for this current regime). The Supply Chain Department is targeted in many ways by people to get unfair advantage; money speaks very loud and all kinds of ingenious ways are found to influence decision makers. The result was (is) more rules and attempts to keep the criminals at bay and resultant red tape frustration for the ordinary tenderer. 1: Attend the briefing and ensure that your name is recorded on the record. 2: Request a list of all attendees after the briefing just to know who you are competing with. There will always be uncertainty whether you understood the intent of the tender well enough and you will always worry that you may have tendered too low or too high. It is imperative to be in good standing with the Revenue Department – ensure you have an original tax clearance certificate. Make sure your FICA documents are in order. Stick to the knitting – write clear and concise and let the facts and figures impress them – don’t exaggerate! 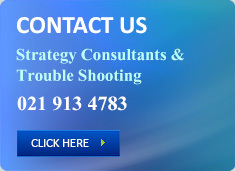 If you think tenders are waste of time – try Quattro Strategy Consult – we have done it before. Contrary to perceptions RFP’s does not mean that the institution has run out of ideas! It simply means that they are more open to suggestions and are probably looking for more economical ways to get something done. RFP’s are opportunities for creative thinking and ideas engineering. In many cases it will require outsourcing and even turn-key management. 1:You need to have a track record or at least proof that you can operate on the level you claim. 2: Start immediately with your research and co-opt knowledgeable people. 3: Try to establish the root of the problem – why is it necessary to engage with outsiders to propose a solution? 4: Be very concise in your opening statement and keep the readers interest by a logical expansion of your plan.